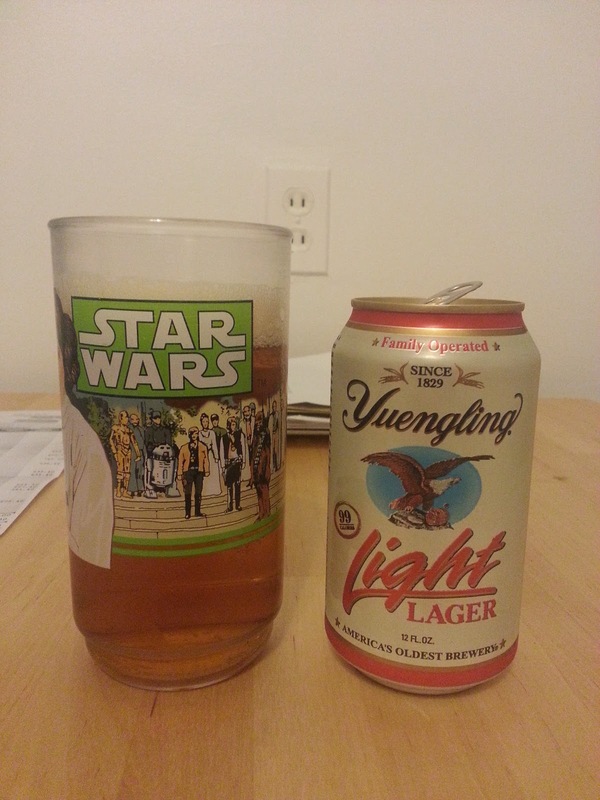 So this is Yuengling Brewery's Light Lager. I know what you're thinking: "Yuengling makes a light beer?" They sure as heck do! If you want to know a little bit about Yuengling, the oldest brewery in the United States, click right here. The can claims its 99 calories and the website says 98 calories; so someone is a dirty liar and, for all intensive purposes, a real piece of crap. Yuengling Light is pretty underrated. I mean you can drink a million of these and never gain a pound. I said a million monsignor! Plus, it's only .1 grams of fat; would I lie to you? About THIS? Well you wanna talk about the beer? Ok, let's go! It goes down faster than a Australian grad student at a Silverchair concert. If you had to slam a beer, like really slam. Like King Midas had you by your collar? Yeah, this is your choice. Now, all beer has a downfall, well most beers. And this one is its ABV, but no shellac, Sherlock. This has a great great taste and is lighter than a drowning rat. The ABV is 3.4% which is as pathetic as watching a senior citizen trying to do a pull-up. Even an old navy seaman. This is a great beer to the kids, you stuff a few of these in your backpack and take em to a football game and the coppers are after ya, well you can chug these bad bastards and take off through the woods to your buddy's house. Well, he's not your buddy, just a guy who let's you drink at his house when his parents are out of town. The government will tell you without a doubt that beer is bad for you, but what do they know? I think even pregnant women can slug this guy; I mean its 3.4%, it doesn't take a total turkey to tell you 6 or 7 of these will be safe. I want a dozen. The can, well, is pretty typical by Yuengling standards; eagle and all that. But it's got a distinct color which will make people be like "what the heck is that?". And you can be all coy and say "Oh, this, yeah its Yuengling, the light one, no big deal. What do you got there? Lager, yeah that's alright, I drank that last year." But I wouldn't say I'd pick this over Lager or Black and Tan, I mean I rarely have to drink on the run these days, especially with my bad knees. And its ridiculously cold this time of year. As far as light beers go, this is a big winner. It runs about $18 bucks a case, which, at that ABV is as smart as smart as buying a Smashmouth CD. There are definitely better beers for the price, but its a great beer nonetheless. I recommend it for chugging in parking lots, alleys, bathrooms, on porch's at family events where you are too young to drink.